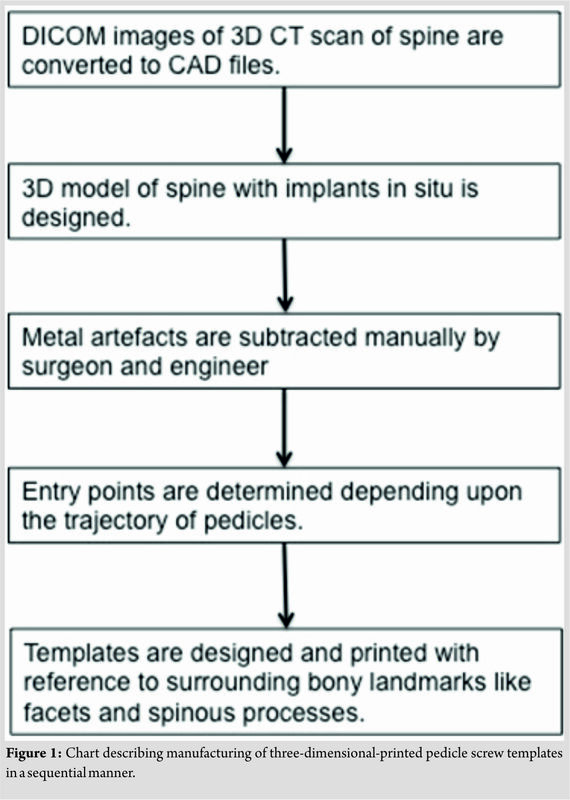 While designing the 3D-printed patient-specific pedicel screw templates for patients undergoing revision spine surgery, one must be aware about the existence of “pseudoforamina” and metal artifacts so as to optimize the use of this templates. 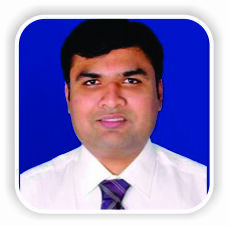 “Spine and Pain Clinic”, LBS Road, Ghatkopar West, Mumbai, Maharashtra, India. 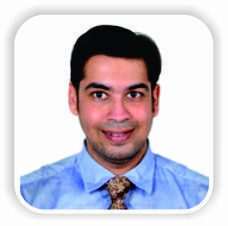 Clinical and Research Fellow, The Spine Clinic, Lilavati Hospital and Research Center,A-79, Bandra Reclamation, Bandra West,Mumbai – 400050, Maharashtra, India. 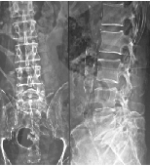 Introduction: Revision deformity correction surgery of a pediatric spine, especially with sublaminar Soacing between wires in situ, is a daunting task for patient as well as treating physician. Obscured native anatomy in the presence of sublaminar wires poses a staunch intraoperative challenge for a surgeon for safe placement of pedicle screws so as to avoid neurological and vascular injury. In revision surgeries with previous implants, it’ is challenging, especially due to metal artifacts in imaging,bone loss due to previous surgery. In this note, we describe the technique of making making three-dimensional (3D)-printed patient-specific templates for safe placement of pedicle screws in pediatric patients undergoing revision kyphoscoliosis surgery with sublaminar wires insitu. 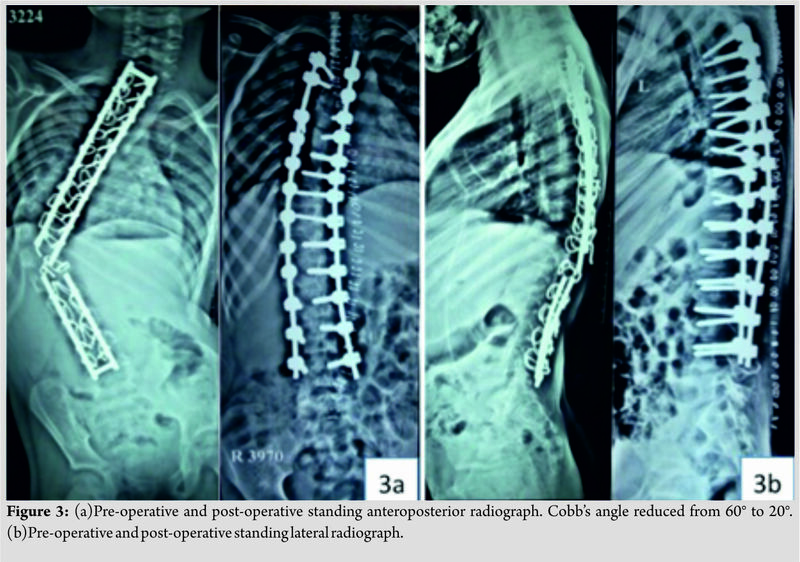 Case Report: A 12-yearyear-old female presented to the clinic with a history of early-onset scoliosis, for which she underwent deformity correction surgery with spinal rectangle loop and sublaminar wires 4 years ago. At presentation, she had decompensated with increase in deformity and failed implant. She underwent revision deformity correction surgery with pedicle screws. 3D-printed patient-specific pedicle screw templates were useful in this patient for appropriate pedicle screw placement, as patient had obscured native anatomy due to fusion mass and in-situ sublaminar wires. Conclusion: 3D-printed patient-specific pedicle screw templates are very useful in revision pediatric deformity correction surgeries, especially when the obscured native bony anatomy makes free-hand insertion of pedicle screw unsafe. Keywords: Kyphoscoliosis, revision surgery, three-dimensional printing, pedicle screw templates. Three-dimensional (3D) printing or additive manufacturing is a technique of manufacturing objects layer by layer using computer-aided design (CAD) files . In the past two decades due to technical advances, 3D printing has been used overwhelmingly for patient care in orthopedics. This avoids the use of molds that were used traditionally to manufacture the objects. 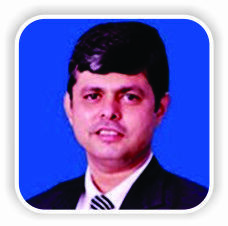 Recently, this technology has found its ground in spine surgery in many aspects such as making patient-specific orthoses, use of biomodels for pre-operative planning, manufacturing customized implants, minimally invasive spine surgery, patient-specific pedicle screw templates, and manufacturing of artificial intervertebral disc by stem cell bioprinting . The use of 3D templates is well described in primary scoliosis. Revision deformity correction surgery with sublaminar wires in situ in pediatric spine is a daunting task due to difficulties in appropriate placement of pedicle screws. This is due to obscured native anatomy due to fusion mass and preexisting sublaminar wires.The incidence of implant-related complications in revision spine surgery in pediatric patients is 7.5–12.5% . Uses of 3D templates are well described in primary scoliosis. 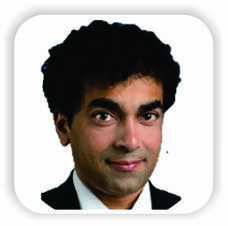 In revision surgeries with previous implants in situ, it is challenging, especially due to metal artifacts in imaging and bone loss due to previous surgery. In this technical note, we are describing challenges in manufacturing of this template in pediatric complex revision kyphoscoliosis surgery with sublaminar wires in situ. 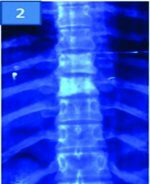 A 12-year-old female has presented to the clinic with the history of early-onset scoliosis and progressive deformity for 6 months. She underwent deformity correction surgery with spinal loop rectangle and sublaminar wires 4 years ago. On examination, patient was decompensating in coronal and sagittal plane. Neurological examination was within normal limits. Standing anteroposterior and lateral radiograph revealed failed implant with progression of deformity. Cobb’s angle was 64° at presentation. 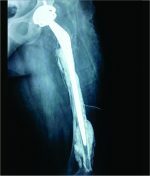 The patient underwent implant removal and revision deformity correction surgery with pedicle screw-rod system simultaneously. The patient-specific 3D-printed pedicle screw templates were used for safe pedicle screw placement. These templates are manufactured by 3D printing technology using CAD files but in a sequential manner (Fig. 1). In the first step, images were acquired using multidetector computed tomography(CT) scan and a 3D image of patient’s vertebral column was created. Computer software was used to convert digital imaging and communications in medicine (DICOM) images to 3D model of spine. This software was Mimics Innovation Suite®, Materialise, Belgium (Mimics Medical and 3-Matic Medical 11). DICOM data of the patient’s CT scan were imported into Mimics Medical 19. On initial examination of 3D model, it was asserted necessary to separate the vertebral column from the residual implant. This was done initially by segmenting the bone and implant using different respective threshold values. Next,further segmentation was done manually to eliminate the artifacts caused by stainless steel spinal rectangle loop and sublaminar wires.The implant and vertebral column were then imported into 3-Matic Medical 11 software and were used as base data to manufacture pediclelocating guides for each vertebra, using various CAD tools available in the software. 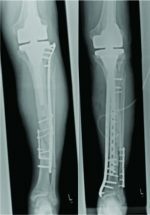 Biomedical engineer and surgeon together differentiated metal artifacts and bone defects so as to make templates with maximum bone contact surface possible. The final 3D-printed model of spine and the design of templates are illustrated (Fig. 2). These templates were manufactured using polyurethane material.Hence, they could be sterilized and used intraoperatively for creating the tract for appropriate placement of pedicle screws as bony landmarks for putting pedicle screws by free-hand technique were obscured. Placement of pedicle screws was assessed postoperatively on CT scan. (Fig. 3) illustrates the pre-operative and post-operative radiographs of a patient. Pedicle screws in lumbar spine were typically placed by free-hand technique. However, in thoracic spine placing a pedicle screw is a difficult task due to complex local anatomy. Moreover, in severe kyphoscoliosis, the pedicles are often dysmorphic along with distorted bony landmarks . This makes the free-hand technique more technically demanding in addition to the preexisting difficulties that exist while placing thoracic pedicle screws and hence require high level of expertise. Hence, the technique of using customized templates for correct placement of the difficult pedicle screws in the patients is always intriguing. 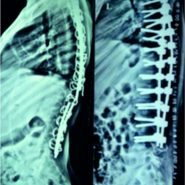 The use of customized pedicle screw templates in rigid scoliosis is described previously in literature with acceptable accuracy . Takemoto et al. reported success rate of 98.4% while using the patient-specific template for placing pedicle screws in rigid scoliosis. Liu et al. also found 3D-printed pedicle screw templates to be more accurate compared to free-hand technique (93.8% vs. 78.8%) for pedicle screw insertion in thoracic spine in patients with rigid scoliosis. However, the literature lags on the use of this 3D-printed patient-specific pedicle screw templates in the specific cohort in question. In patients undergoing revision deformity correction surgeries, challenges for designing 3D-printed patient-specific implants are mainly attributed to the metal artifacts and “pseudoforamina” on CT scan. Pseudoforamina are defects in the CT image arising due to low CT signals produced from thin bone (due to previous surgery) . 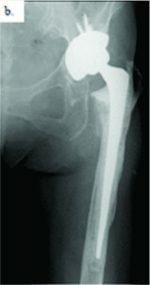 The problem of metal artifacts due to preexisting implants and pseudoforamina must be corrected and eliminated before designing the templates. In the present technique, reducing the effect of partial volume averaging by decreasing the CT collimation thickness helped to reduce the effects of pseudoforamina and metal artifacts. Apart from the mentioned technical pearls, meticulous surgical dissection is equally important for adequate exposure of bone for accurate placement of templates. Moreover, it is very important for careful removal of sublaminar wires so as to cause less damage to lamina and bone loss so as to avoid malpositioning of templates. We believe that this technical note helps in better manufacturing of templates and the placement of pedicle screws in revision pediatric kyphoscoliosis. 3D-printed patient-specific pedicle screw templates are very useful in revision pediatric deformity correction surgeries, especially when the obscured native bony anatomy makes free-hand insertion of pedicle screw unsafe. However, surgeon should be meticulous about the presence of metal and bony artifacts in revision surgeries while designing the templates. The use of 3D-printed patient-specific templates in deformity correction surgeries is revolutionizing the approach of surgeon toward this complex spinal pathology. However, for revision surgeries treating surgeon has to be meticulous and aware about mentioned technical pearls while designing these templates. 1. Michalski MH, Ross JS. The shape of things to come: 3D printing in medicine. JAMA 2014;312:2213-4. 2. Rengier F, Mehndiratta A, von Tengg-Kobligk H, Zechmann CM, Unterhinninghofen R, Kauczor HU, et al. 3D printing based on imaging data: Review of medical applications. Int J Comput Assist RadiolSurg2010;5:335-41. 3. Richards BS, Hasley BP, Casey VF. Repeat surgical interventions following “definitive” instrumentation and fusion for idiopathic scoliosis. Spine (Phila Pa 1976) 2006;31:3018-26. 4. Liljenqvist UR, Halm HF, Link TM. Pedicle screw instrumentation of the thoracic spine in idiopathic scoliosis. Spine (Phila Pa 1976) 1997;22:2239-45. 5. D’Urso PS, Williamson OD, Thompson RG. Biomodeling as an aid to spinal instrumentation. Spine (Phila Pa 1976) 2005;30:2841-5. 6. Takemoto M, Fujibayashi S, Ota E, Otsuki B, Kimura H, Sakamoto T, et al. Additive-manufactured patient-specific titanium templates for thoracic pedicle screw placement: Novel design with reduced contact area. Eur Spine J 2016;25:1698-705. 7. Liu K, Zhang Q, Li X, Zhao C, Quan X, Zhao R, et al. Preliminaryapplication of a multi-level 3D printing drill guide template for pedicle screw placement in severe and rigid scoliosis. Eur Spine J 2017;26:1684-9. 8. van Dijk M, Smit TH, Jiya TU, Wuisman PI. Polyurethane real-size models used in planning complex spinal surgery. Spine (Phila Pa 1976) 2001;26:1920-6. How to Cite This Article: Gadiya A, Shah K, Nagad P, Nene A. A Technical Note on Making Patient-Specific Pedicle Screw Templates for Revision Pediatric Kyphoscoliosis Surgery with Sublaminar Wires In Situ. Journal of Orthopaedic Case Reports 2019 Jan-Feb; 9(1): 82-84.